Next up in the series on Alien Fresh Jerky is this "Colon Cleaner Hot" variety. You can read my reviews of their jerky varieties by clicking on "Alien Fresh Jerky". The closest food to eating fire, this stuff measures 250,000 scoville hot units!!! BE WARNED: This is very very VERY hot jerky - it's not spicy, it's not mild, IT'S EXTREMELY HOT!!!! By comparison, a raw jalapeno pepper ranges between 2,500 to 8,000 scoville units, while the habanero pepper ranges between 200,000 to 300,000. So, I'm expecting my mouth to experience the insanity of a whole habanero pepper. The first thing I taste from the surface of these pieces is a bit of saltiness, and slowly I feel the burn coming on. I can taste a faint bit of chile pepper flavor. In the chewing, I taste little else. For being billed as a hot jerky, this is indeed hot, and I'd probably rate this as "hot" my hot scale. After two bites of this stuff, my eyes are watering, I have sweat percolating out of my scalp, and my nose is starting to run. I'm someone who considers himself as tolerating hot foods fairly well, so keep that in mind. But while this jerky pumps out a lot of burn, it doesn't really offer much flavor. I think the primary flavor of this jerky is that light saltiness. And I think "light" is a good measurement. The only other flavor I can get from this is a light bit of chile pepper flavor. I can't detect the soy sauce listed in the ingredients. 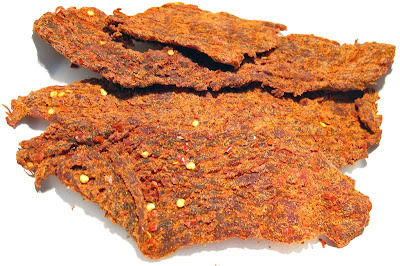 Overall, what you'll get from this jerky is a lot of burn, but very little flavor. These appear to be slabs of whole meat, sliced to a medium thickness, and in medium to large pieces. This is a dry jerky, but feeling quite soft and tender. Tearing pieces apart with my fingers seems fairly easy, while chewing is somewhat easy. The chewing texture of this stuff starts out with a bit of rubbery resistance, but seems to chew down to a soft mass fairly easily. At that point, it kinda has a steak-like feel, but it's also somewhat mushy. It still has a fibrous quality, similar to steak, but it just doesn't feel like steak. Each bite I take also leaves behind an unchewable wad of tissue. It's still easily swallowed, but that wad tends to subtract from my chewing enjoyment. The pieces appears to be free of any visible streaks of fat, but then again it's hard to tell due to all the orange chile powder covering these pieces. Aside from the unchewable wads of tissue, I didn't find any gristle. All that powder does pick up on my fingertips as I tear off pieces, requiring some licking off, and the tearing off drops quite a bit of powder on my lap. If you're eating this stuff at the office, hold it over your desk, or a plate. For general jerky snacking purposes, at the $1.67 price per ounce, this jerky presents a weak value. I'm not really getting much snackability out of this. There just isn't a lot of flavor coming out of this. The meat consistency is "fair", with a lot of unchewable tissue found in the meat, and not quite totally a steak-like chewing texture. As a hot jerky, at the same $1.67 price per ounce, it's an excellent value. If you just love jerky that burns your mouth, this'll give it to you. 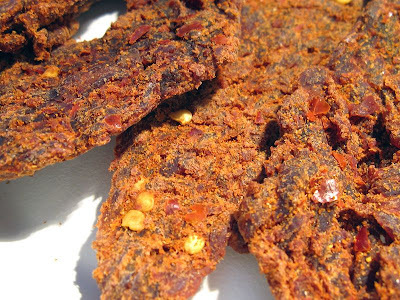 Personally, what I like about hot jerky is the flavor of chile peppers, not so much the burn of chile peppers. There actually is only a light chile pepper flavor in this. The biggest drawback I found with this jerky is it's lack of flavor. I only found a light saltiness, and a light chile pepper flavor. While it does provide a lot of burn, that's really all you're getting, a lot of burn, but not much flavor. The meat consistency is fair, I particularly didn't like feeling those unchewable wads of tissue is just about every bite. Perhaps the best thing about the meat consistency is that it's still a soft and tender chew. So is this the hottest jerky I've ever had? No. I still say the "Ring of Fire" variety produced by TM Jerky & Processing is hotter than this. I reviewed that variety in the Papa Dan's and Dad's Jerky brands. It's not only hotter, but it provides a strong chile pepper flavor, and a light meat flavor, and that gave me a good reason to tolerate the heavy burn. My recommended beer pairing for this jerky, try a smooth creamy stout.